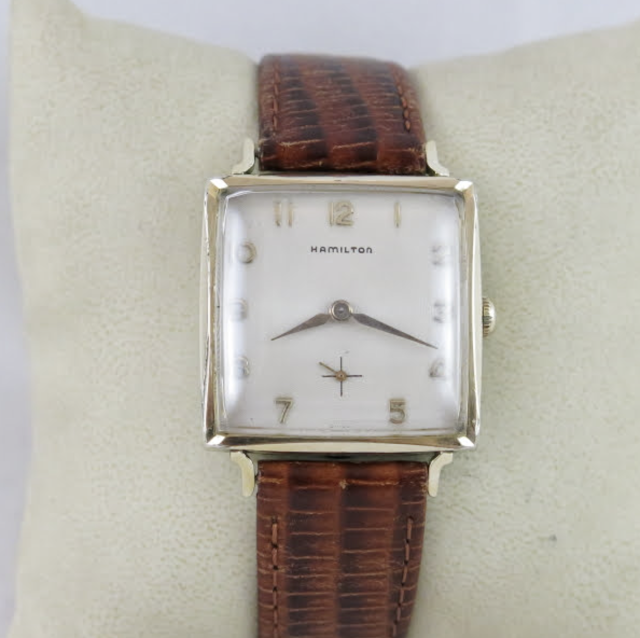 There are a number of very similar square watches from the 1950's and 1960's. It's sometimes hard to tell them apart. They may differ in size, lug shape, the movement inside or the dial design. One of the models you don't see very often is the 1959 Trevor - it was produced for only one year. 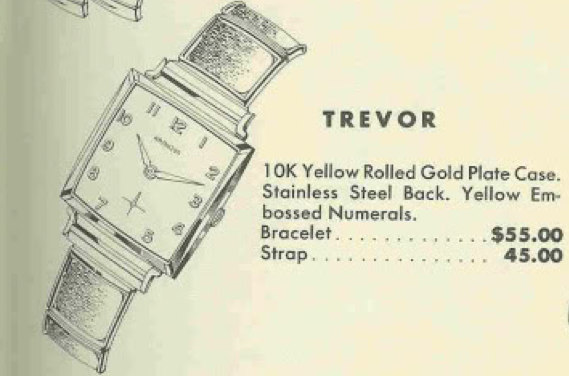 The Trevor was in the entry-level line up of Hamilton's models. It came in a 10K yellow rolled gold plate case with a stainless steel back. The embossed dial has a circular pattern with golden-colored numerals. Inside is a 17 jewel Swiss-made Hamilton 673 movement that was made by A. Schild. I recently picked up a Trevor project watch and you could describe it with just one word - Nasty. It smelled as dirty as it looked. I couldn't tell if it was a few decades of cigarette use, motor oil or maybe both. But like many Hamiltons, it was given with love from someone to someone… in this case from FG to JD on November 24th, 1959. Out from behind the beat up crystal, the dial is an old refinish - you can tell by the seconds track - it should be simple cross hairs. Also, the finish on the right side has been compromised by moisture. I'm going to try to clean it but refinished dials don't always clean up well and this is a textured dial - which would be a pain to refinish again. It doesn't looks very dirty in the shot below, but I can tell this movement hasn't been cleaned in a long time. One indicator is it's not running. While everything is being cleaned in the ultrasonic, I'll replace the crystal with a new acrylic replacement. Everything is cleaned and dried, even the dial cleaned up fairly well. Well, right out of the chute, it's running about a minute slow per day but a little tweaking to the regulator will bring it inline. Just a slight nudge to the regulator and the beat rate is brought right in line. And here's the finished product on it's pillow shot. The new crystal hides most of the dial finish loss on the crown-side so the watch looks pretty good, I think. I may think about getting the dial redone anyway - just so the seconds track looks right. However, I also noticed a little wear to the case on the left after I took the picture - so maybe this watch is as good as it is going to get. I decided to get the dial redone since it was already refinished incorrectly and the lacquer was failing. Now it looks more like it should and is much more appealing to the eye, I think.